You can read my article on the new Chinese regional restaurants in the Guardian here. I thought I’d use my blog to offer a bit more information. Chef Ren Jianjun, a native of Yueyang in northern Hunan Province used to work at the Shangri-La Hunan restaurant in Oriental City, Colindale. Ignore the entire front section of the menu and turn to the back, which is conspicuously RED because of all the chillies. 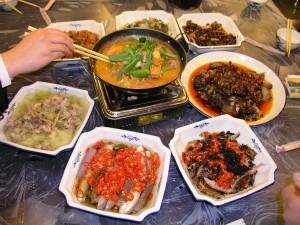 Here you’ll find a wonderful selection of hearty Hunanese dishes which are among the most authentic in London. This miniscule restaurant on Roman Road seems a little confused about what its English name actually is: the sign outside merely says ‘Chinese restaurant and takeaway’, but the menu is emblazoned with ‘Top Taste’. Anyway, ignore the dishes you already know on the menu, and try to order the Liaoning dishes, which are marked with red stars on the menu: my top tip would be to look at what Chinese guests are eating and order some of those dishes. Apart from the dishes mentioned in the Guardian piece, we enjoyed the anise-scented ‘pork with vermicelli’, and the superb ‘pan-fried garlic chive pancake pockets’. Thanks to Kai Wang for telling me about this place! Bright Courtyard Club has an excellent eclectic, pan-Chinese menu, as well as lunchtime Cantonese dim sum, but I go there for the Shanghainese food, which sadly is no longer listed separately, so you may have to ask for help. I recommend the magnificent ‘braised pork belly slices with preserved vegetable’, an inky stew of pork with umami-rich dried mustard and bamboo shoots; the Shanghai wontons served in a delectable broth; and ‘Shanghai tofu with mushrooms’ – a fermented gluten appetiser you’re unlikely to find on any other London menu. Red Sun has fewer interesting dishes, but I really love their stir-fry of green soybeans with pickled greens and slivered pork (‘shreds pork with chinese pickle soya bean’). Ask them for Shanghainese dishes. Frustratingly, they don’t translate the Chinese names of many of their specialities here, but Joe, a young Fujianese waiter, speaks good English and has promised me that he’ll help curious diners navigate the menu. Ask him for the gorgeous fish balls (yu wan 鱼丸)– springy, cloudlike spheres of conger eel stuffed with minced pork and served in a light broth; glassy sweet potato noodles with mixed seafood (hai xian shu fen mian 海鲜薯粉面); cabbage and clam soup with slippery rice pasta (hai xian guo bian 海鲜锅边); or so-called ‘oyster fritters’ (hai li bing): traditionally made with a little oyster, here they are stuffed with a mix of pork, cabbage, beansprouts and celery. The sweet potato balls (fan shu wan 番薯丸) are also highly recommended. 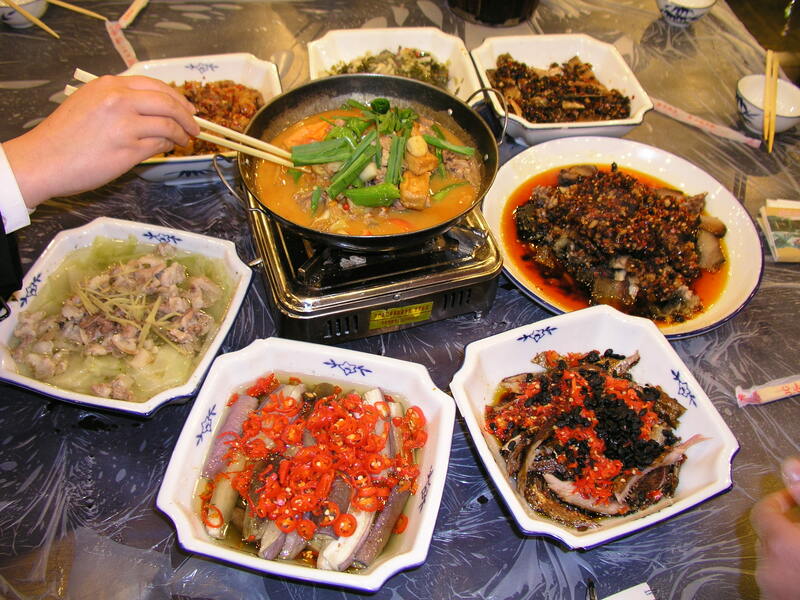 GUIZHOU: Maotai Kitchen (nong jia da yuan农家大院): Many interesting Guizhou dishes from which to choose. Sichuan Folk is not mentioned in my article, but it’s one of the best new Sichuan restaurants. You can read Jay Rayner’s review of it here. Great article and thanks for Top Taste on Roman Road – it’s just round the corner and one I hadn’t spotted. We are also fond of My Old Place and Gourmet San – these too are the subject of great Jay Rayner reviews! He does love his offal and chilli. Thanks for this much needed list (and the excellent Guardian article). Have you come across a restaurant in London that specialises, or even just includes, Yunnan-style cooking? I did have one excellent dinner at Yipin China a while ago, so yes, it could have been included on my list! Luke – I’ve never had Yunnan food in London. For Dan dan noodles, try the restaurants I work for: Barshu, Baozi Inn and Baiwei (Baiwei do my recipe for Xie Laoban’s dan dan noodles). But my top London tip is to make your own from my recipes! I make large stocks of the pork topping and freeze them in thin layers; I also freeze the ya cai. If you make the pork mince THIN it defrosts very quickly, as does the ya cai. It’s one of my basic stand-by recipes for quick lunches! Great article Fuchsia, but you’ve missed a trick, the best of the lot. Surely Silk Road in Camberwell has to feature – the best Xingjianese food this side of Urumqi! Ally – I’ve only been to Silk Road once, and to be honest I was disappointed that it’s not actually a Uyghur-run restaurant as one might imagine, but a Xinjiang restaurant staffed by Han Chinese – who have totally different food traditions. This was reflected in the food… although we had some delicious (pork) dumplings, some of the dishes were pale imitations of the real Uyghur versions and not at all what I remember from eating in Xinjiang! Perhaps I should try visiting again. Thanks for this list. I have not been to any of these as I don’t usually know how to order regional Chinese dishes. I am very comfortable with the Cantonese restaurants in town. Will have to explore these ones. that is real progress ! Great article but you missed out on two great places: Old Place in Liverpool Street and Chilli Cool in Russell Square. Being a Sichuanese GODDESS of the kitchen I am hoping you can answer this question. Raw Sichuan huajiao is banned in the U.S. and ALL the commercial stuff is crap because it has gone through some kind of heating process—-huajiao is part of the citrus family—and thus is feared to possibly contain a bacteria harmful to citrus production—-anyhow—-the question of the century is whether or not RAWd and gorgeous Sichuan huajiao can be imported into Britain? First of all, thank you for your very kind words! I know that it is hard to find good huajiao, but I’m, not sure whether the heat-treatment is to blame, or just the poor quality of the original pepper. Certainly, in Britain, where we don’t have to have it heat-treated, a lot of the huajiao on sale has no zing at all. I’ve always blamed the fact that it’s mostly sold by Cantonese, who don’t use huajiao for its tingling, numbing qualities – so they are not attuned to sourcing the good stuff. I have bought decent huajiao in Britain, but not consistently. I suggest you contact Peppermongers, who do their best to find tingly huajiao.